I’m not a big pumpkin lover; I rather agree with the way the family I once nannied for in England felt about them – they laughed when Imade them roasted pumpkin, telling me pumpkins were only for feeding to horses! But hold on, before you let the horses have them, at least scrape the seeds out first, dry them and toast them – I love those pepitas. They remind me of travelling in Turkey, where all through the countryside are fields dotted with huge piles of the stringy orange flesh, the prized seeds having been extracted for drying. Turkey was where I gained my appreciation for cracking open roasted sunflower and pumpkin seeds with my teeth, and deftly extracting the meat within with my tongue (great snack to have with a bottle of Efes). Seeds, yes, pumpkin flesh itself, no – cloying, heavy, sticks to the roof of the mouth. 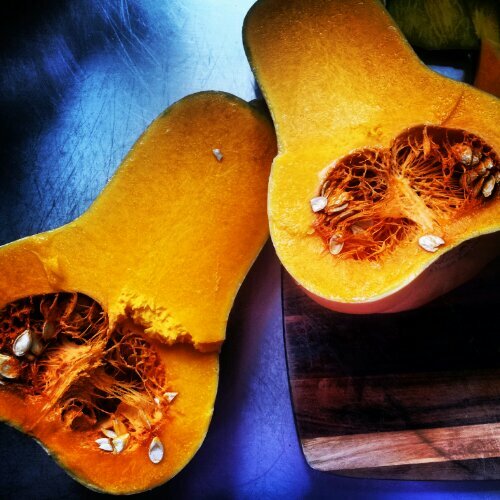 Other squashes I can do – spaghetti (where can you even buy them nowadays?) and butternut would be my picks. The other day I picked up two weighty butternuts for the bargain price of $1. And that’s something I have to give squashes – kudos for their ability to feed an army for very little coinage. I often roast slices of cubes of butternut to make salads with, but the other night I was in a soup mood, so I took them home and went to work. Oh yeah, I just remember the other reason I rarely buy squashes, and when I do, I tend to roast them with the skin on – because chopping them up (giant pumpkins being the worst here) is a life-threatening, and plainly exasperating operation. The bit where you get the knife stuck in the middle and it won’t budge. And when you suddenly get leverage, you risk accidentally flinging the knife – or knife with pumpkin attached – across the room. There’s probably some easy trick to cutting up a pumpkin and removing all the skin, but Idon’t have the patience to learn it. Take two medium butternut squashes, peel and cube and cook in boiling water until tender. Meanwhile, sautee 1 onion (I used red as it’s all I had) and 3 large cloves garlic until softened. Add a 1-inch piece galangal, finely chopped; 1 stick of lemongrass, very finely chopped; 1 chilli, finely chopped, towards the end of sauteeing. I used jalapeno which I have growing, for a nice mild kick. 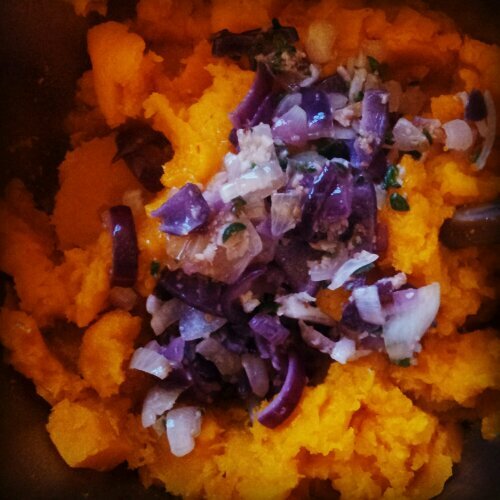 Drain the cooked butternut and use a stick blender or processor to puree the cooked pumpkin and onion mix. Return the pumpkin mix to the stovetop and turn on the heat. Add about two cups of water, 4 Tbsp fish sauce, 3 Tbsp tamarind paste, juice 1 lime. Stir well and let it come to the boil. Taste and season. Add more water if you like it a bit thinner. I made a nice crunchy topping for this soup by toasting some cashews and coconut flakes in a hot dry pan, then ading a bit of coconut oil, garlic and chilli and sauteeing till the garlic is cooked. Add a bit of sweet soy sauce and a squueze of lime juice. A handful of coriander leaves would be a great addition, too. 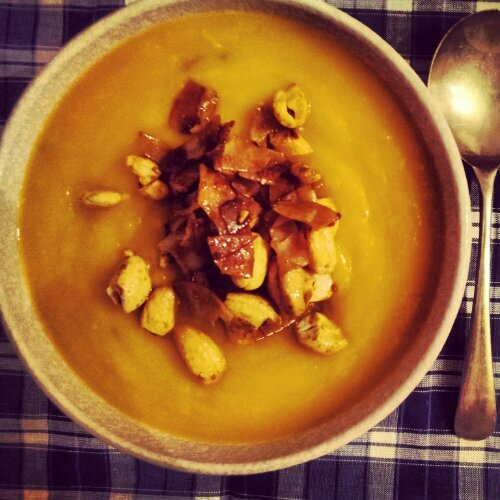 Dish the soup out into bowls and top with the cashew garnish.